Yesterday I shared Nicole by OPI's Deck the Dolls* (review here), which is a really pretty aqua blue polish with a metallic finish. 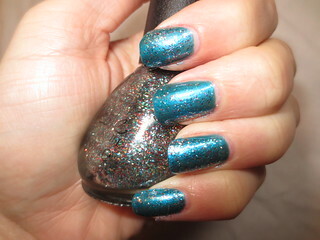 I decided to layer Nicole by OPI's Kardashing Through the Snow* over top, to add a bit of glitter and fun to my manicure! Kardashing Through the Snow is a glitter top coat polish. It consists of very small silver, red, and blue glitter pieces. I think that this polish compliments Deck the Dolls perfectly, and it makes the manicure a lot more special and exciting. Of course, you could only use Kardashing Through the Snow on your accent nail, for a toned down, but still fun look. Kardashing Through the Snow isn't a chunky glitter, so it's not going to be bold or in your face. Unlike NOPI's All is Glam, All is Bright (reviewed here), I don't think you could build this polish up to an opaque finish. 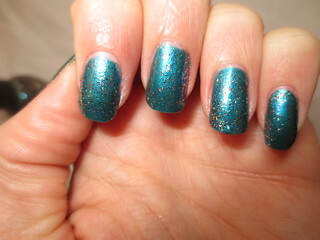 This is meant to be used as a glitter top coat, and I think it looks beautiful as such! I only needed one coat of this glitter polish to achieve an even spread of the glitter. With some glitter polish, you really need to work with it to ensure that each nail has equal glitter. Kardashing Through the Snow is so easy to work with, and I think that it would compliment almost any base colour. Are you a fan of glitter top coats? What other polishes do you think Kardashing Through the Snow would look great over? Leave me a comment below! I just tried it over Orly "Grave Mistake" and it looks very pretty.